Cyclone Well Drilling installs submersible water pumps which are most commonly used with drilled wells. A submersible water pump operates beneath the Earth's surface and needs to be submerged in a liquid such as water. This type of water pump pushes water to the surface, instead of sucking the water out of the ground like above ground water pumps. Most submersible pumps are long cylinders that are about 3 to 5 inches around and 2 to 4 feet long. These water pumps have a hermetically sealed motor that is close-coupled to the body of the water pump. Having a hermetically sealed motor prevents the water from getting inside the pump's motor and causing a short circuit. Other components of a submersible water pump are the cable, which is connected to the motor, and a pipe that transports the water to the surface of the well. 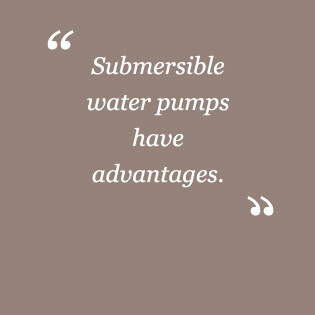 Submersible water pumps have a lower rate of mechanical problems because they don't have to pull water up out of the well. These pumps can last up to 25 years before needing to be replaced. Submersible pumps are more efficient in their use of electricity; they pump twice as much volume and twice as much pressure as a jet pump of equal horsepower; they never lose their prime; and because they are in the well they will not freeze in the winter.